Just as we began to leave breakfast, it started lightly raining but we continued walking. Then the rain really began to pick up in what can only be described as torrential downpour. We quickly made it to an awning where we stood for some time as we tried to wait out the storm. While standing there a man who was soaking wet came by on a bicycle. I remember thinking “Man, I’m sure glad I’m not him.” Then he stopped at our group and said “Umbrellas: $5 each” I have to hand it to the guy, he really took an opportunity and made something of it! After we stood under the awning for a while, the rain still wasn’t letting up. We headed inside the restaurant but we saw that we were having no luck with the rain. So, we all piled into some cabs and finally (about an hour and a half late) got to the convention center. At the convention center, they had tons of fun activities for us including zip lines, ropes courses, inflatable rides, bumper cars, and mini-golf just to name a few. In addition to all of the fun, there were many worthwhile causes that we had the opportunity to participate in such as the Million Books Project, a blood drive, and hair donations. 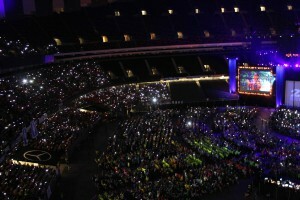 Later in the evening, we headed once again to the Superdome for the night’s gathering. We got to hear several more speakers and great artists. We got to hear the music of Rhema Soul, an awesome pop and hip-hop group as well as the music of Lost and Found. We first got to hear from Jamie Nabozny who suffered the harassment of his peers in school and went on to win a landmark legal case for it. Now he speaks up against bullying and educates young people. He encouraged us to stand up when we see bullying happening for all of those around us. We also heard from Diane Latiker who began an inner-city mission called Kids Off the Block and became a mentor to these kids in need. One of the most interesting speakers we had tonight was Leymah Gbowee, who is a 2011 Nobel Laureate and a Liberian peace activist. The most powerful part of our speech came at the end. She told us how when she was a child one of her favorite songs was “This Little Light of Mine.” Each of us has a light, she said. She instructed us all to take out our cell phones and hold them up. What was first a dark arena became full of light. When we all work together, she said, this is what our lights can do. It was such an awesome thing to see of of the people with their “lights” held high!Tomorrow, we get to participate in our Practice Justice day. We will be serving the city of New Orleans in new and exciting ways! As always, don’t forget to check out our Photo Gallery (**CLICK HERE**) for pictures from today. More things to come, Peace! Thanks Nick.. We were able to participate here with the live stream. Quite a wonderful evening with music and speakers..Have fun tomorrow and I hope it doesn’t rain on you all…. Thanks for the updates, Nick. Aren’t the speakers and musicians awesome? I’m guessing your day of service was today; I know you worked hard and you were probably in the really hot weather so I’ll wait til later to see how you all did. Take care, all of you!